The weather has been a little bit funky here in Arizona and my Christmas break is being threatened by rain and snow in the high country. In spite of the predicted elements, my good friend Pete and I loaded up the truck hastily made our way to Red Rock Country and the fabled Oak Creek. While driving creekside, we caught glimpses of a high, turbulent, and off color torrent that did not look very fishable. Regardless, we had made the drive and were not easily deterred. I had brought my 5 weight knowing that with high winds predicted, I would need a little backbone to cut through the wind and throw some heavier streamers. With no insect activity, I opted to strip a simi-seal bugger through the first pool and on my third cast through the pool, saw a large head engulf my fly. Luck was on the fishes side and he spit my fly quickly. After several more pools, hook-ups, and fly changes, I rigged up a mini hopper and a copper john variant and drifted it several times through a likely lie. 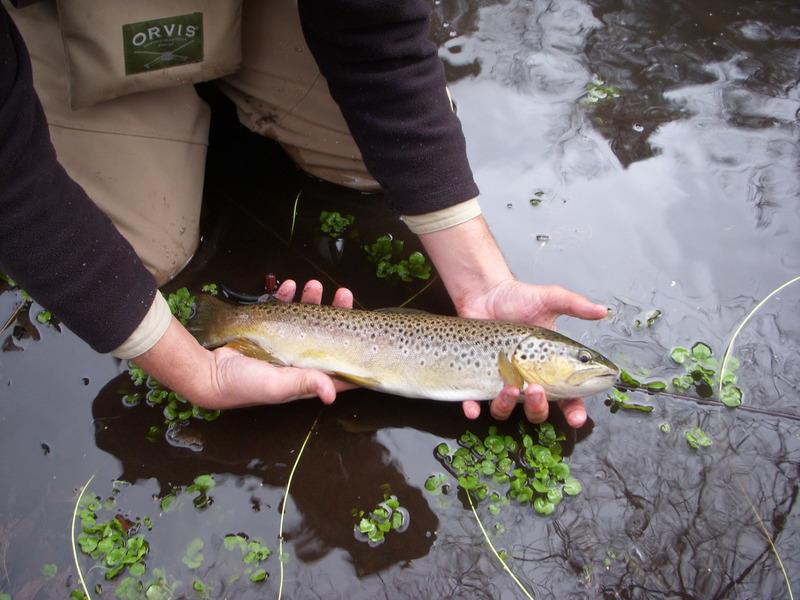 I was extatic with a firm hit on the dropper and was soon cradling a gorgeous Oak Creek Brown trout. I always feel extremely blessed when catching brown trout out of this section of Oak Creek, because I know that these fish see so many fishermen and their offerings. 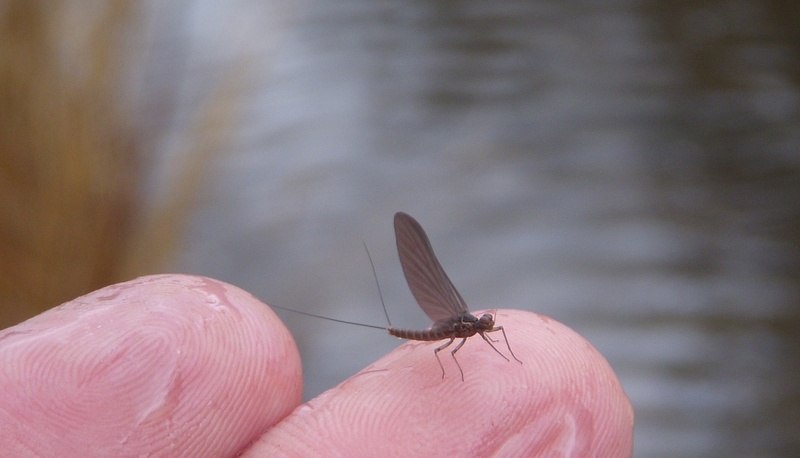 As I continued fishing I saw a few sporadic rises, but the high, milky water made it difficult to fish small dries that wold match the small winter bugs that were hatching. Occasionally a bigger specimen would fly by and tempt me to tie on something smaller but I refrained. Making my way upstream, I found myself again stripping a leach through a larger pool and had several larger hits on the streamer. On one last try, a strong fish nailed the fly and head shook his way to my net. At this point I was feeling very lucky as I held this football of a brown for a quick photo. With half a dozen pools left before our access point to leave, the day began to get colder. Thankfully, the inclement weather had held off and no precipitation ruined our day. As I followed the course of the stream I came upon an extremely long pool with several obstructions in the center of the pool. I worked the lower section of the pool with my bugger and had several fish follow it in but ultimately refuse it. While contemplating my next move, a fish rose and sent large ripples radiating to the banks of the stream. I quickly tied on a #16 parachute Adams, said a little prayer, and dropped a perfect cast just to the side of his previous rise. 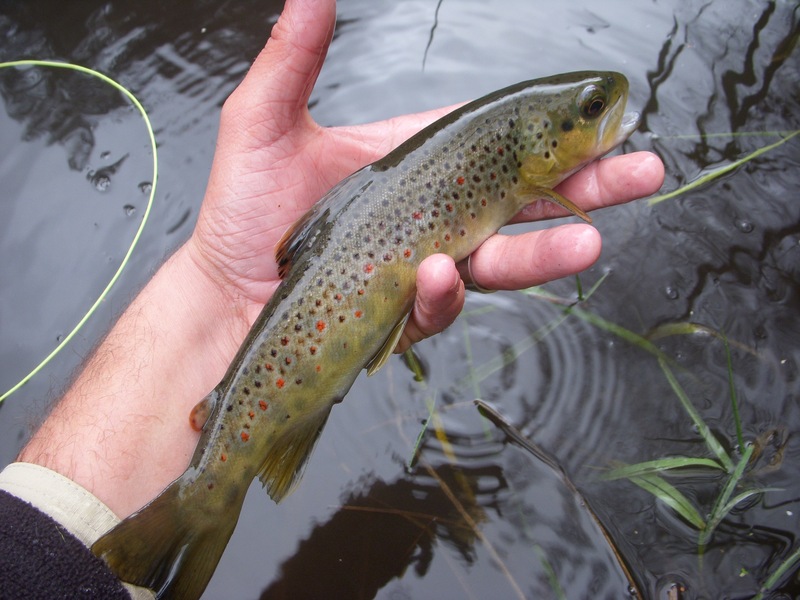 Within moments, the trout nonchalantly sipped the dry and I was latched into a large fish. Luckily, I had my 5 weight and was able to muscle the fish away from several large rocks and half submerged logs and stabbed my net a fish that could barely fit inside of it. I had heard of large fish in Oak Creek and have spooked and occasionally tied into some, but have never been successful at getting one to hand. After this fish, I did not need to fish the rest of the day. This is one of those times I wished I had a measuring tape, so without going into guessing on numbers, all I will say is that it was a big fish. Streamers, nymphs, and dries all seemed to be the ticket for the day. The high water conditions made it some of the toughest and most frustrating fishing but the outcome of the day was extremely rewarding. Quality day spent on the water with good company is a great way to spend time off from work. I have only fished Oak Creek once, and it was in June. So I had to fight with the crowds. I’m looking forward to getting up there Early in the Spring, and hopefully next fall. What sections of the canyon do you fish? 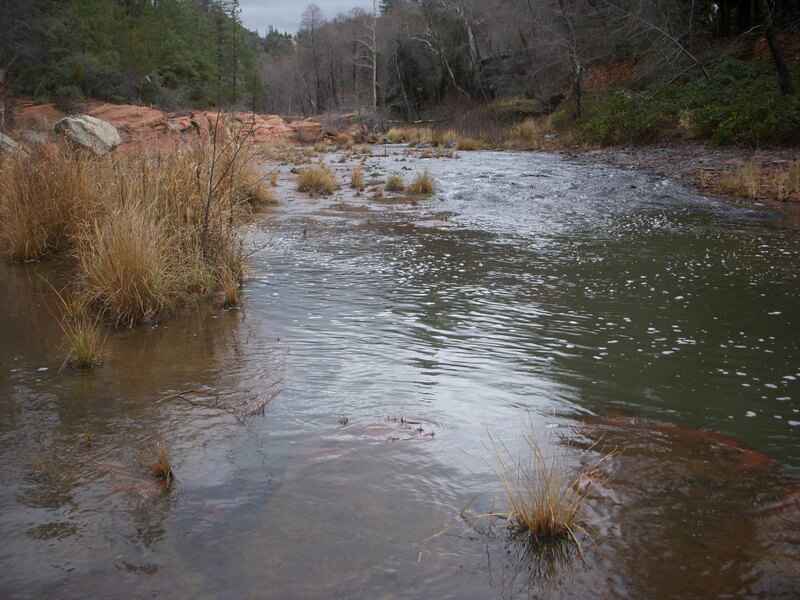 With the Runoff it might make fishing a little more difficult in some of the lower areas. But when I was there in the summer those looked like the most enticing except they were full of tourists. Thank you Connor. Oak Creek is tough because it is so popular. My goal is to always be the first guy. If someone is splashing around or fishing in front of you, you might as well give up and go somewhere else. Without being too specific, I like to fish anywhere above Slide Rock. There is so many good spots you can’t go wrong. I think you’re right though, spring is good, but fall is the best. The crowds thin out and the fish are much more active. All of the larger fish that I have caught in AZ have been in higher off color water. I think that these conditions give the angler the edge in getting closer to the bigger wily fish. Thanks again for the kind words. Good luck next time you’re at Oak Creek. thats a beautiful brown no matter the season. i am sure it is a little sweeter as it was taken during such turbid conditions. well done. Thanks Ivan. The taste of success was very sweet. I’ll be on cloud 9 for a while with the memories of that fish. Thanks again. Two strikes in your favor. A day off work and a couple of nice Browns. Awesome day, any way you look at it. Don’t I know it. One of the perks of being a teacher is the days off offset the crappy pay. I was lucky to get into the fish that I did. Thanks for the kind words. Nice to see someone is catching fish. So no snow down there even in the hill huh? Just doesn’t seem like winter fishing if there isn’t snow, where I’m at we have a few feet of it and snowshoes will be required gear for our January 1st Catch and Release season opener. Thanks for helping tide me over. Couldn’t help but laugh. No snow in the lower hill country. Up in the higher elevations there is but Sedona is in the middle. Like we talked about before, I grew up in upstate NY and won’t be too sad if I never see snow again. Good luck on your season opener and glad I could help. 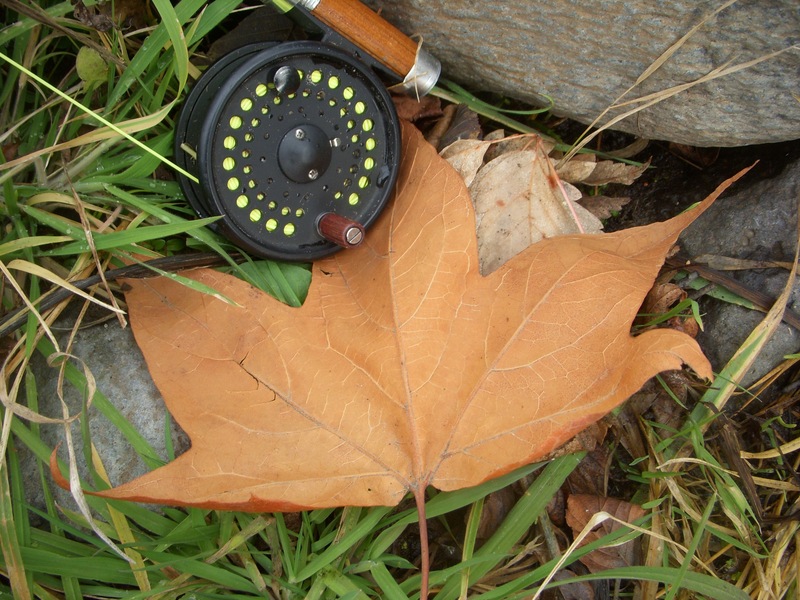 Oak Creek is on my list, for sure … I hope to get down to Arizona in early spring–hopefully, the browns will cooperate! Great post! Very cool Chris. Oak Creek is one of those iconic Arizona fisheries and the scenery never disappoints. If you’re needing a partner, feel free to drop me a line and I would love to head up and fish with you. Tight lines. OK, next time we go to Oak Creek. Those are some nice fish and I love stripping streamers! Nice work buddy. Ha. Yeah, my bad. It was a nice day with such off conditions. We’ll head up there next time. Thanks man. In my 2+ years of fly fishing I have spent more days on Oak Creek than anywhere else. I love it up there. 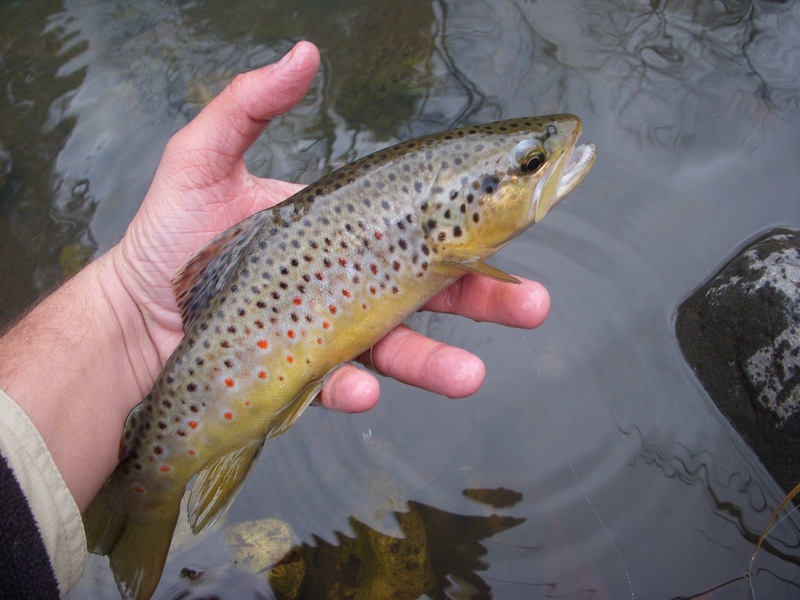 It can be tough to fish, compared to some of the rim streams, but catching a brown there is so rewarding. I have a favorite spot there that is out in the open, yet hidden…if that makes sense. Tons of people there on a summer weekend, but every time I fish that spot I am the only one with a rod. I love Oak Creek. I know exactly what you mean. For a stretch of water that sees so much use, it still fishes surprisingly well. And for anyone who wants that seclusion, it can be found. Glad you enjoy fishing it as much as I do. One of these days we’ll have to get out and fish it together. Take care. I would enjoy that. Come on spring. Merry Christmas. Adding Oak Creek to the bucket list. Challenges are good. Right on Mike. When you get out here let me know. Thanks for stopping in. That is an amazing fish. Oak creek is my favorite trout stream in the world. I am hopefully going to get up there early next week along with a day of tubing deadhorse state park. Man I love Christmas break!!! Ha. I hear you about Christmas break. Let me know how things pan out for you up there. I’m nervous about all the rain we’ve received, but maybe the waters will slow back down in a couple days. Tight lines.